After you've set up a master file with inserted subprojects, you can create links from one project to another. Cross-project linking enables project managers to link tasks in one project to tasks in another project. For example, you may have a task or milestone in one project that drives a line item, task, or milestone in another project. When you create a dependency between tasks in different projects this way, any changes to the start or finish date of the external task are automatically reflected in the successor task of the other project. There are two basic ways to set up links between projects: You can manually type the path and filename in the Predecessors column, or you can use the Link tool, as shown in Figure 4. I've found that it's much easier to create a link using the Link button in the Schedule group rather than trying to remember the full path name and correct syntax to type into the Predecessors column. You also have the option to type directly into the Successor column if it's displayed in the table. After cross-project links are established, you can view them in the source files as external links. External relates to those tasks outside of a project. 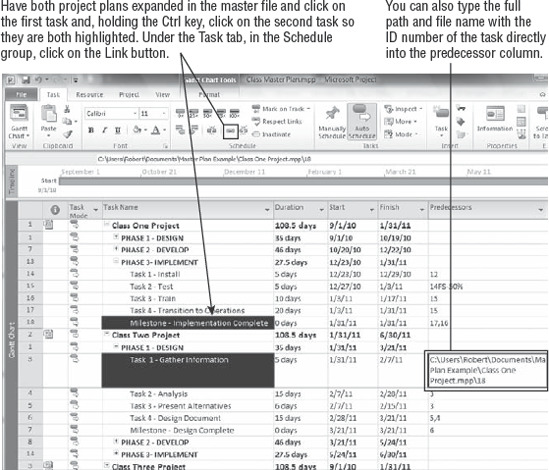 These external tasks are sometimes called ghost tasks, a name that refers to an external (replicated) task, as shown in Figure 5. External tasks aren't displayed in the master file if both tasks are expanded and displayed, because they're both in view. 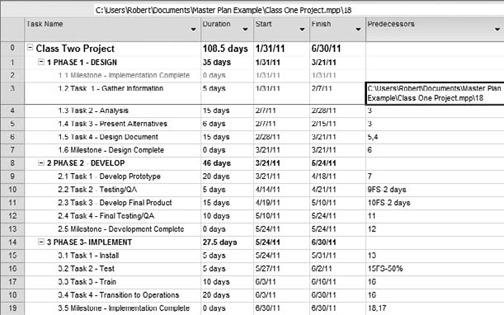 When either project is displayed alone (for example, doesn't contain the other as an inserted project), the external task is displayed with special light-gray ghost formatting so you can easily distinguish it from other tasks. If you're working in the source files, one project gets an external successor task and the other gets an external predecessor task. If an external task is displayed as a ghost task in the active project, it gets its own ID in the active project (not necessarily the same ID it has in its parent project). A predecessor ghost task is inserted just before the corresponding internal successor task, and a successor ghost task is inserted just after the corresponding internal predecessor task. However, if a ghost task representing the external task already exists, then that ghost task is used to represent the external task in all the relationships it may have with tasks in the active project. In other words, if two tasks in the active project both have the same external predecessor, only one ghost task represents that external task in the active project. While you're in the source file viewing the external link, you can also edit it. If you double-click a cell in a ghost task, Project opens the external project and places the cursor at the proper task. The cross-project link can be edited in either project. You can delete the ghost task from the internal task's project. Doing so removes the link and removes the ghost task from the internal project. This action has no effect on the external task in the external project except to remove the cross-project link (and the appropriate ghost task) when that project is updated.